It might not have been a good result for Garry Pearson, but it’s a good result for us, the rally fans. What a fecht in the Grampian forests. 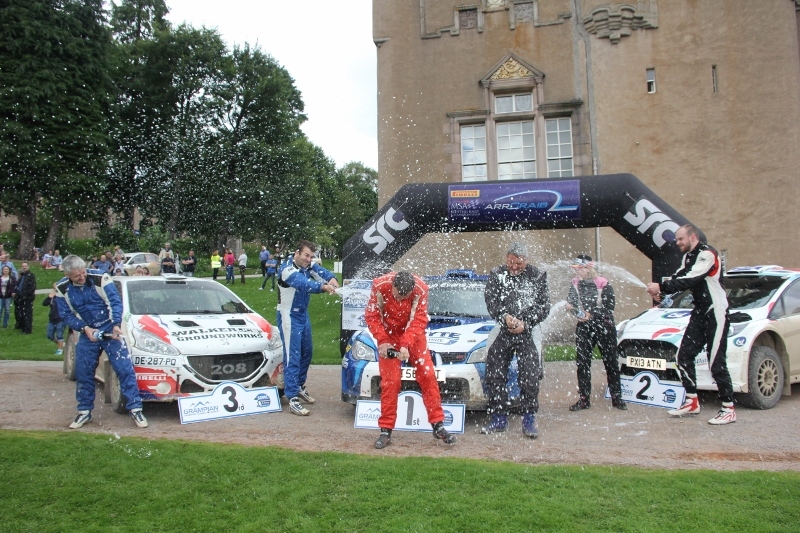 Going into the final stage on today’s first ever Coltel Grampian Stages, there was a three way tie for second place. Hoping to clinch the ARR Craib Scottish Championship title today, Garry had to content himself with fourth place. That means the title fight will go all the way to the final round at the other end of the country in the Galloway forests next month – hence the good news for us. There was no doubt about the winner though, Dave Weston came out and did what he does best. Jump into a strange car and win the rally. Mind you, Pearson was quickest on the first stage by a second, but thereafter it was Weston all the way. Mind you he did have one complaint. When he jumped into the Melvyn Evans Subaru on Thursday he almost jumped in the wrong side. It was a right hand drive car and previous cars from Melvyn have been LHD. Although he won: “I still didn’t like it, the steering wheel was on the wrong side!” said Dave. Some folk are just SO pernickety, eh? Pearson ended the day in fourth place with his Fiesta: “I backed right off in the last two. I thought if they want to go for it, then let them,” but he didn’t put a wheel wrong all day so that has set him up for the next round. Jock Armstrong was fifth in his Subaru, and but for a mistake on the third stage, he might just have finished a wee bit higher up: “I got the first few hairpins right in the long stage,” said Jock, “then I got it all wrong and ended up having to choose between a ditch or a banking when I went straight on.” That cost him half a minute, but he was rallying with a broken toe on his right foot! 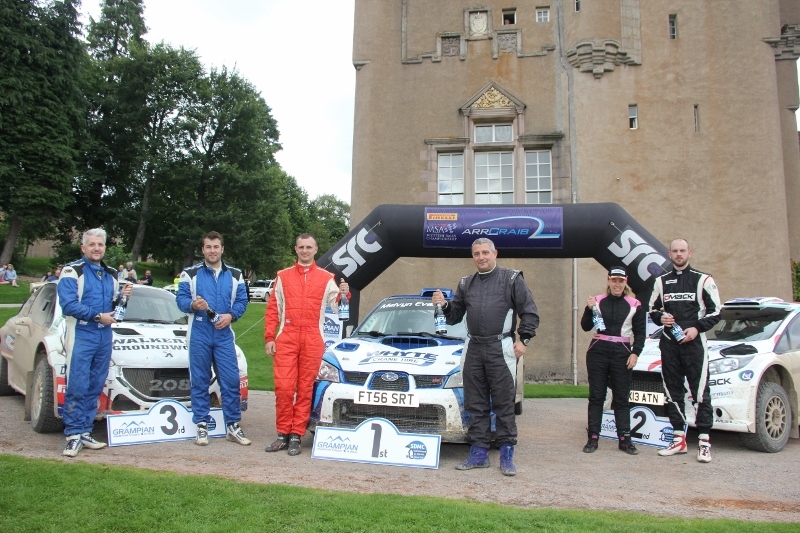 Rounding off the top six was Mark McCulloch who was as pleased as punch at the end of the first two stages: “That’s the first time I’ve taken time out of Mike (Faulkner) but I was getting ragged, I just need to pull it back a wee bit.” And he did. Speaking of Faulkner, he punctured a front tyre in the 16 miler and ran for 11 miles on it, hence the big time loss and then punctured again on the final stage. Not his day. Shaun Sinclair started well but pulled out in the second stage with a severe vibration and Freddie Milne found an accommodating banking on which to park the Lancer - irretrievably off the road. But what a great day out. If Stonehaven & DMC can book the same weather next year, then we’ll be fine., the compact route and the Start/Finish/HQ venue all worked a treat – and the venison burgers were magic.